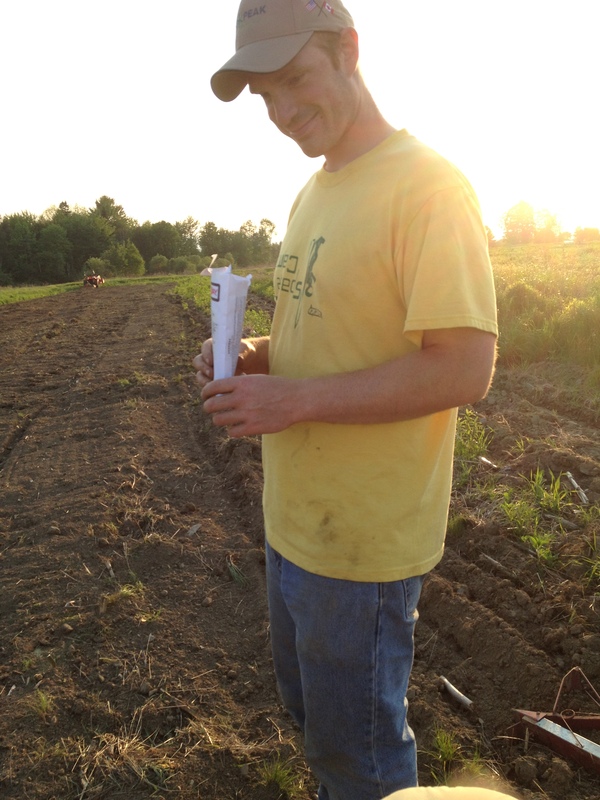 I recently helped my friend, Josh, plant some seeds and starts on his farmland out in the Northeast Kingdom. Josh’s family has always produced vegetables on their small-scale farm for area farmers’ markets, but this year Josh is running the operation on his own. When I visited Josh’s land, I got to help him plant some of the usual crops that I have in my small garden: tomatoes, squash, pumpkin, green beans… but the planting process was a little bit different here. Forget the gentle loosening of roots on the tomato starts. Just drop them a couple paces apart for the length of the field and then walk back through and quickly tuck them into the soil a few inches above the roots. And while in my small garden I planted every squash seed with an exaggerated amount of care, here we just opened up a small hole in the soil every three paces, dropped three or four seeds in, and were on our way. It’s funny how long my friends and I took to plan and decide and gently dig up homes for plants in the small garden plot we have when I compare it to the farmers’ methods. But I guess it’s only fair; any farm must be at least 50 times the size of our garden. It wouldn’t be as big of a deal if two or three tomato plants didn’t survive on the farm since this is such a small fraction of the crop. While I am not about to move away from the more gentle and tedious methods of the gardener, I’m glad to have a farmer friend as a resource. The next day, when Josh visited our garden, he shook his head when he saw how I, on hands and knees, meticulously plucked out small weeds from a bed of soil I hadn’t planted anything in yet. He grabbed a hoe and we broke up the weeds. I grabbed a small rake and pulled out many of the larger weeds before scooping some of the smaller pieces up in my hands. In all reality, the garden isn’t just a place to grow food. It’s a place to relax, work hard, get dirty and watch life grow. So, while the farmer has some shortcuts that will still yield a good crop, I know I’ll continue to take the longer and maybe more laborious route for my miniature field of vegetables. I’ll continue to use my farmer friends as a great resource for planting and pests and so on, but somehow the garden would still feel like a productive use of my time even if it failed to produce much of any food.